I am so happy Thanksgiving week is here!!! Our college kiddo came home last night, the kids are all requesting their favorite dishes, and I have so much to be thankful for! As I was driving in to work this morning, I was thinking about the first Thanksgiving. I started thinking about the early settlers and how they had a plan, tools, and supplies, yet their encounter was SOOOO unpredictable! I thought, ‘Isn’t that true for us today? OUR encounters are unpredictable!’. Even in our businesses, we never know what challenges we will face. How did the early settlers succeed??? They had leaders… they had workers… they had investors… and… they were willing to give back! The Chamber acknowledges and is thankful for the leaders, workers, investors, and consumers in Breckenridge. We are especially thankful for your willingness to give back to the community! Thank you to those who do business here, to those who serve the community, participate in activities, and for building relationships that make this town strong. I hope we continue to attract new settlers and to build with determination! I am personally thankful for way too many things to list; however, professionally, I am thankful for the amazing people I have been blessed to work with. I wish each of you a Happy Thanksgiving! Do you want to invest in the 2018 Breckenridge Airshow? Check out this link to our sponsorship packet so you can see the different levels of investment available. Keep in mind our VIP tickets are $125 each so there is a real value included in each level. 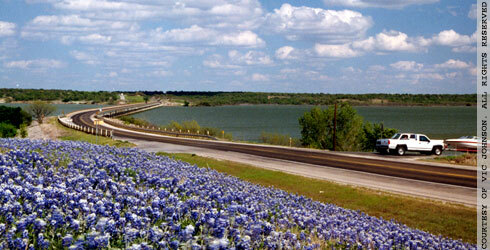 Call us at (254) 559-2301 with any questions! 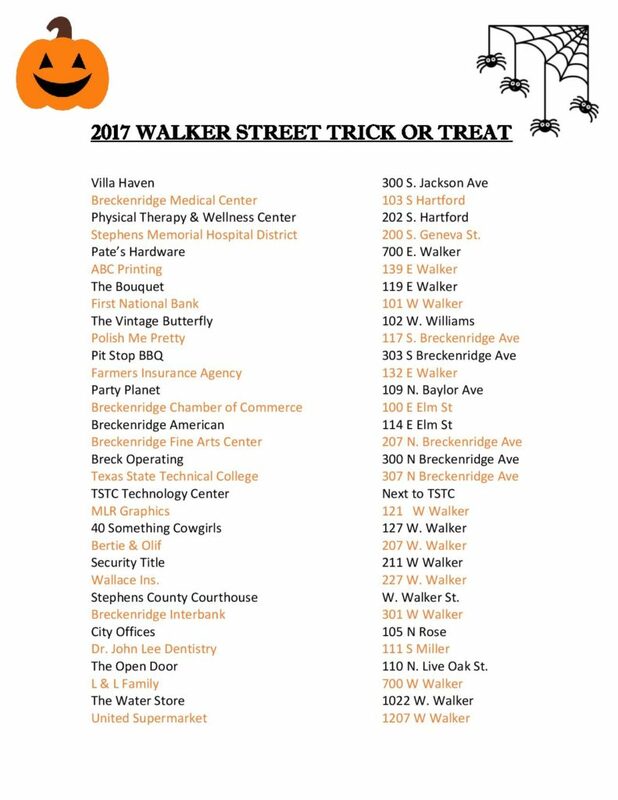 It’s time for our Annual Walker Street Trick or Treat! We have spread WAY beyond Walker Street but that just makes it ever more fun! 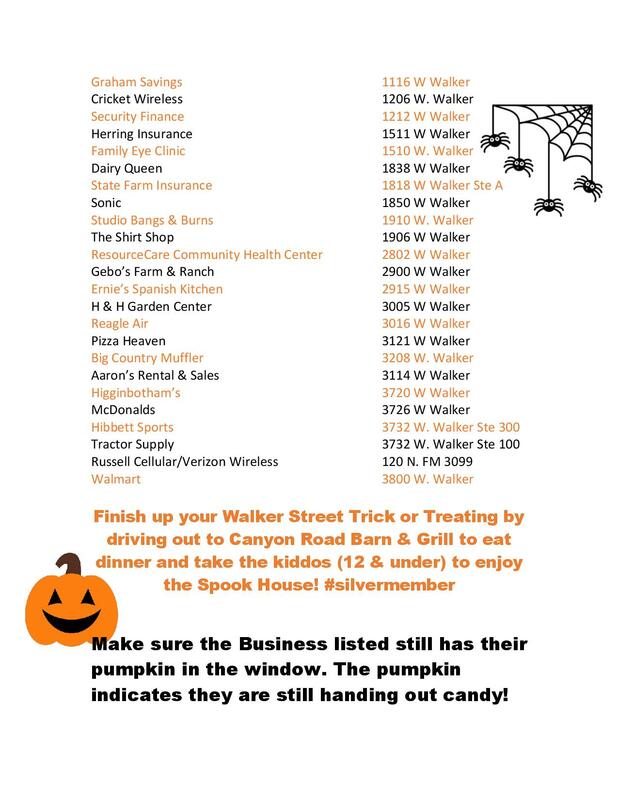 Lots of places to stop in and get candy but don’t forget you can finish out the DAY Trick or Treating with dinner and a ‘spook house’ at Canyon Road Barn and Grill THEN head out to the NIGHT events! THANK YOU to all our Chamber Members who wanted to participate in this FUN, FAMILY event! Check out our new Buckaroo Stadium packet for information on how we can host YOUR next playoff game! Congrats to Saturday’s winners at The Johnny Bates Memorial Golf Tournament! Bunkhouse Divas Boutique & Co. Please make sure and thank these business for their support! Profits from this event will be used for 2018 BISD Scholarships. 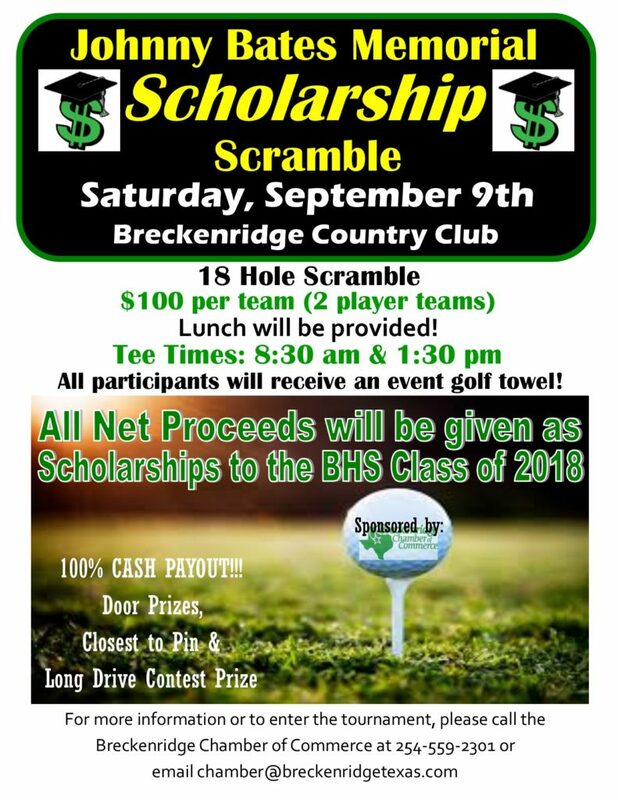 We hope you can join us for the Annual Johnny Bates Memorial Scholarship Golf Scramble! Call (254) 559-2301 to get signed up today! The VOTE is IN! It was a unanimous “YES” so save the date: May 26th & 27th. We estimated a total of 8,559 attendees over the weekend. Check out a teaser of our weekend! It has come to our attention that we need to address our changes in the 2017 Calendar of Events. Namely, the lack of mention of Boomfest. It was decided in September of 2016, after months of discussion and event financial review, that Boomfest 2017 would be canceled. In an effort to (1) better utilize Chamber funds for events and (2) not over tax our membership by seeking additional sponsorship, the Board of Directors made the tough decision to remove Boomfest from the 2017 Event Calendar. Weighed into that decision was the $1,000 a minute price tag, trash issues with the lake itself, low-paying attendance and the reality of seeking sponsorship in Frontier Days, Breckenridge Airshow and then Boomfest, all within a 90-day span. Along with that, we considered the mission statement of the Chamber of Commerce: The Breckenridge Chamber of Commerce is an organization of businesses and individuals that work to promote the area by developing a strong and vibrant economy through business advocacy and leadership, thus creating a better quality of life. 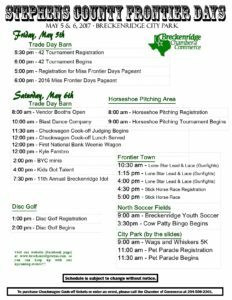 The decision was made prior to the Breckenridge Airshow’s success; however, the Breckenridge Airshow is helping Breckenridge, Texas gain nationwide notoriety. I challenge you to google Breckenridge Airshow and also to check out YouTube before being unkind to the 2017 Board of Directors; a Board of volunteers who give up their time and energy to try and bring commerce to our community. The life blood of our future is dependent on bringing in new customers, commerce and, hopefully, residents. 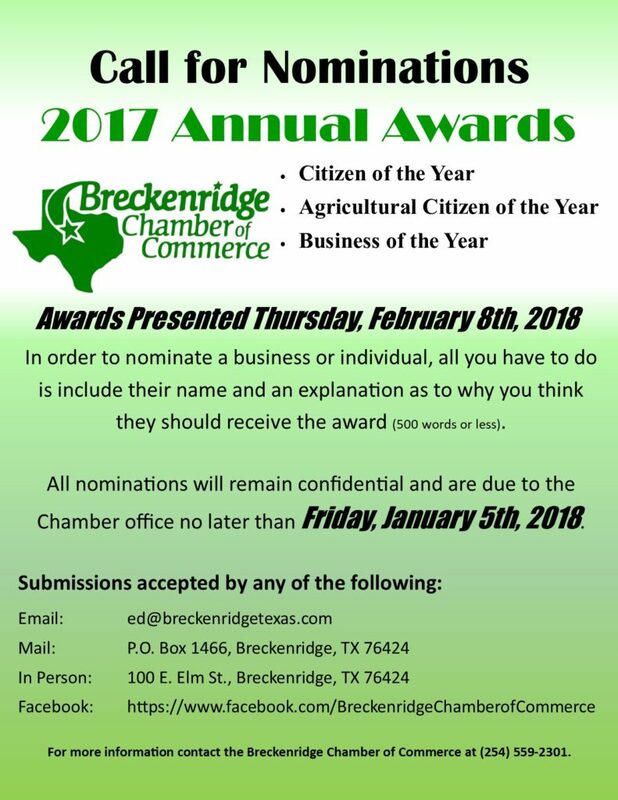 This decision was not made lightly and we appreciate your continued support of the Breckenridge Chamber of Commerce. 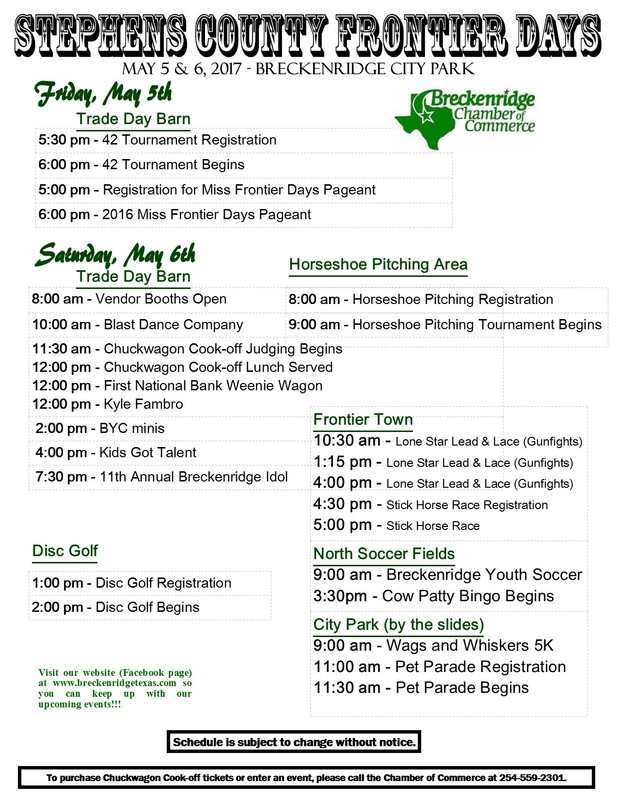 Join us for the Breckenridge Frontier Day’s Bob Drake Memorial Chuckwagon Cook-off THIS WEEKEND! This festival consists of 2 days of entertainment, vendors, food booths, and a carnival fun zone! Check out the Schedule of Events below!